BarTender® Professional includes even more label and card design capabilities, and adds access to external data and support for RFID tags and labels. Use our professionally designed templates or design your own. Let BarTender’s smart wizards guide you through critical design decisions to maximize your printing performance and compliance with important standards. Select among 50+ drawing shapes, and resize, reshape and color them in just about any way imaginable. Use BarTender’s hundreds of symbols and images, or import your own graphics. Use your own fonts or those built into the printer. Design your own forms for entering data at print time. Generate anything from simple serial numbers to advanced custom serialization sequences. Format text any way you want with Rich Text formatting. Enhance imported graphics with high-quality image-processing controls, including brightness, contrast, saturation, hue, sharpness, smoothing and cropping. Recreate legacy labels easily by importing old designs to use as a guide. Link to external graphics to enable dynamic changes. 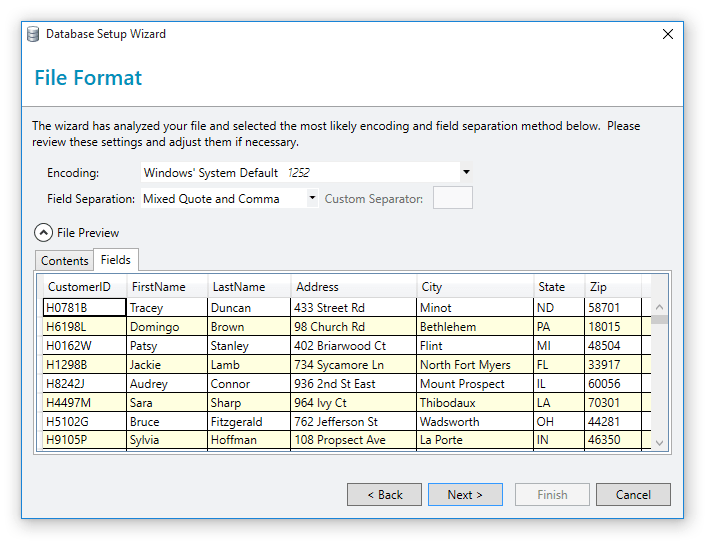 Minimize print-time data entry by letting BarTender pull data from Excel files, text files and a wide variety of databases. 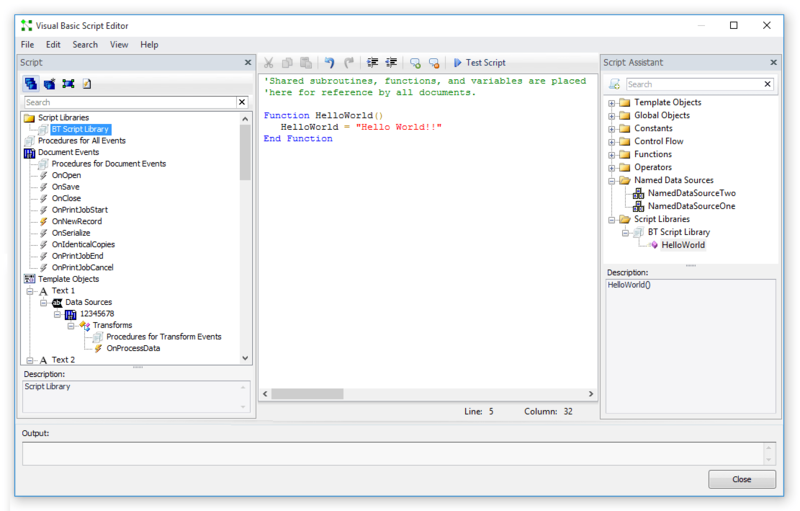 The VB Script Editor is a dynamic tool that makes it possible for users to script data sources. Easily navigate between different scripts in your document, access supported code snippets to help you when writing custom code, and access application-specific VB Script objects, properties. BarTender data entry forms include data entry prompts, query prompts and record selectors on the same form, allowing a user to enter information, query the database and filter database records from the same location. Design multiple forms for a single template, place multiple prompts on the same form, use multiple forms in the same document, and leverage new data entry controls. In addition, new Record Picker controls allow you to display and choose which records to print directly from your form. Create RFID objects as easily as any other label object. Use the clear, on-screen display of RFID chips and antennas to create designs that reduce the chances of damaging the structure and RFID performance. 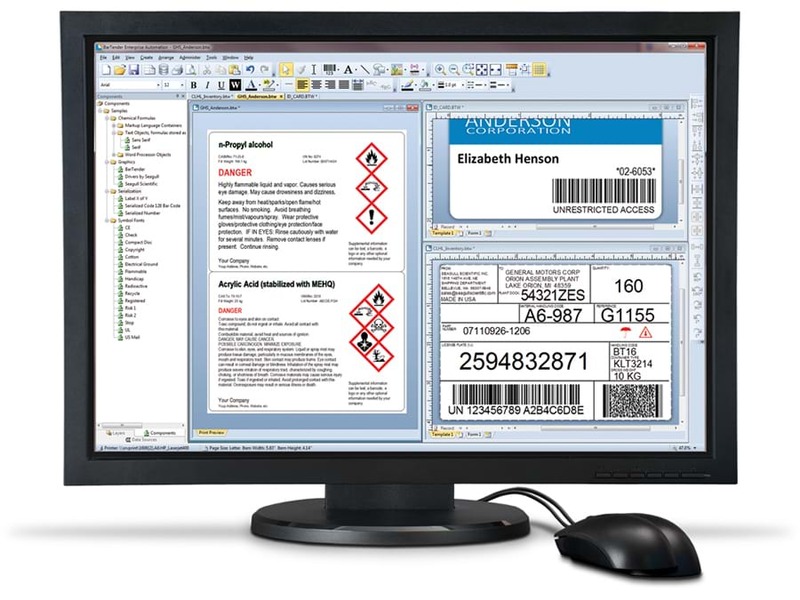 Easily select, preview and print labels and cards from a dedicated Print Station interface. Print multiple label formats as a single batch, whether from BarTender, the Print Station or even the Windows Explorer. Print to any true Windows printer driver, and use our free Drivers by Seagull to leverage the special features of label and card printers for optimal performance. Free phone and e-mail support for all BarTender editions 24 hours a day, every business day. Advance to the Automation Edition for automated printing and the full power of Intelligent Templates. Move up to the Enterprise Automation Edition for complete control and automation of even the most complex business printing environment. See the quick edition selector below or the detailed feature list for more details. Download the free 30-day trial to explore the features of all four BarTender editions and see how it can solve your toughest needs for labeling, barcoding and more. Or contact us to learn more about why BarTender is the most trusted software of its kind. Includes over 400 preformatted, ready-to-use barcode components based on 95 barcode symbologies and more than a dozen barcode standards. Also includes a large number of sample compliance label designs. GS1 Coupons, GS1 Distribution, GS1 General Applications, GS1 Health Care – Non-retail, GS1 Health Care – Retail, GS1 Pharmaceutical, GS1 Retail – General Distribution, GS1 Retail – Non-general Distribution, HIBC (Primary and Secondary), ISBT, TLC (39 and MicroPDF417), DUN, UPS Tracking Number, Design barcodes for almost any other standard using BarTender. AIAG, Caterpillar, DoD, GHS, GM 1724-A, HIBC, MIL 129 and 1189B (LOGMARS), ODETTE, Oracle WMS, Sears, Wal-Mart, SAP AII, SSCC, TLC, UPS, USPS (includes FIM A and FIM C). You can also design labels for almost any other standard using BarTender. Encode text using almost any data format, including support for Unicode, ASCII, Western, Japanese, Chinese, or any other character encoding, including custom formats. BarTender also has predefined barcode components with built-in support for the following data format standards: GTIN-8 (for EAN-8, JAN-8, and UPC-E barcode components); GTIN-12 (for UPC-A barcode components); GTIN-13 (for EAN-13 and JAN-13 barcode components); GTIN-14 (formerly EAN-14 and SCC-14; for GS1 barcode components that use the (01) application identifier, for GS1 DataBar components, and for ITF-14 components); SCC-18 (for GS1 barcode components that use the (00) application identifier). EPC Gen2, EPC Class 1, ISO 18000-6b, ISO 15693, Tag-It, I-CODE, TagSys, My-d, and Picotag tag types. All EPC data formats are supported, including DoD, Wal-Mart, SGTIN, SSCC, GIAI, GID, GRAI, and SGLN, among others. International editions can switch the UI on demand between 23 languages: Chinese (Simplified & Traditional), Czech, Danish, Dutch, English, Finnish, French, German, Greek, Hungarian, Italian, Japanese, Korean, Norwegian, Portuguese (European & Brazilian), Polish, Russian, Spanish, Swedish, Thai and Turkish. Windows 10, 8.1, 8, 7 and Vista. Windows Server 2012 and 2012 R2, Server 2008 and 2008 R2. Includes all 32-bit and 64-bit (x64) editions. The .NET Framework 4.0 is required. The BarTender installer will automatically install all required .NET Framework components.